dropping in distance may suggest connections have fears all is not well. I would be tempted to give this juvenile another chance but at short odds I would take a watching brief. David Elsworth has his team fit and ready and a number of runners making most of the all-weather season. Maid A Million is a bay filly running in the familiar pink and green silks of Khalifa Dasmal. She has run creditably on each of her four start but has been struck by a triple measure of seconditis. Seb Sander has ridden her on each start, so should have some insight to what makes her tick. This step up to 6f looks more suiting after finding the minimum trip too quick. She has ability, but after being the bridesmaid you have to wonder if there isn't a colt who will deal the trump card. It makes me wonder what happened to On Groove in the time it took him to age from a yearling to his second birthday. This son of Iffraaj was originally purchased by John Fretwell for 32,000gns but surprisingly was bought by Marco Botti (running in the silks of his wife) for £800 at the Doncaster breeze-up sales. This seems an incredible buy when the mare won on debut trained by Sir Michael Soute, running in the colours of Cheveley Park Stud. The highlight of her career being placed at Listed class. She ran over 7f on debut at Kempton when pretty unfancied but showed an element of ability. However, that was a moderate contest and more is needed today. This drop in distance doesn't look a problem on breeding although a difficult horse to assess. 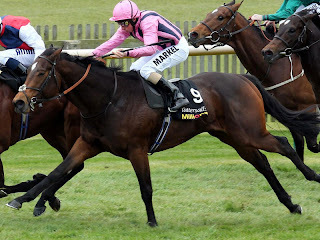 Of the others with experience, Go Far hasn't been since making his debuat at Nemarket at the end of July. This home bred is trained by Alan Bailey out of a mare who many of you will remember - Carranita. This grand old mare ran over seventy times and achieved sixteen wins in her career when trained by Bryn Palling. This son of Dutch Art showed next to no ability on his racecourse bow. The betting is the best guide, and unless substantially backed is best watched. Hans Adielsson has been racing Beauchamp Astra & Beauchamp Sunset as a pair because this will be the third time they have raced against each other. Both are bred to appreciate a much greater trip and look like handicap projects. Exit Claus has been inexperienced on both starts to date and needs to improve. David Elsworth fields an interesting debutante called Calmer Waters. This daughter of Henry The Navigator looks a great breeze-up buy at 20,000gns. Her dam - Passified - was trained by Elsworth, who won on debut over 6f. She proved herself to be a gifted horse who was highly tried at two running in the Rockfel Stakes Group 2 and the US at Hollywood Park. She continued her career in the US, winning at Grade 2 and going close at Grade 1, when finishing third at Del mar on the turf. By all accounts Calmer Waters is a well bred juvenile who catches the eye. David Elsworth trained the mother to win at the first time of asking but generally his two-year-olds need the run. They are often characterised by a slow start, especially over sprint distances. A turning track and wide draw are stumbling blocks against experienced juveniles and this could be a tall order. If strongly fancied in the betting it would give greater confidence. However, a slow start may see any hope fade in a matter of strides. A watching brief. Conclusion: A difficult race to be dogmatic. The major players are Martial Art & Made A Million. Andrew Balding's charge would get my vote but that last effort does bring concerns. The drop in distance is clearly an attempt to control any tendencies to pull but it may highlight this colt is going the wrong way. The horse to beat but at short odds I would have to take a watching brief. Maid A Million has been running consistently and would be a fair each way selection if prices allowed, although that looks very unlikely. On Groove needs to improve an that debut effort but could be wiser today. Another with place claims but a difficult horse to assess. Calmer Waters catches the eye. She is bred to be a talent and both sire and dam won on debut. Elsworth trained the mother so he knows the family. It would give greater confidence if backed, although I would still have reservations. A race full of ifs and buts and a watching brief looks the safest option.